The air in New Delhi is constantly thickened by a suffocating smell of burnt car tires. If you walk around you’ll find the smell coating your tongue like some strange taste. And your ears battle with the cacophony of the ebb and flow of the horn-and-bell concerts played by the Tuc Tucs, autos, busses, trucks, motor scooters and rickshaws. Everything is in motion, everything is colorful, everything is loud. About ten years ago, India joined the ranks of the world’s ten largest economies, and its achievements in IT and pharmaceuticals are of a top class international standard. Not that you would notice this strolling on the streets of India’s capital. But where can you grasp something as complex as the economy or economic growth at first glance? India is a country that is benefiting greatly from the international division of labor and globalization – and yet sells itself below price. 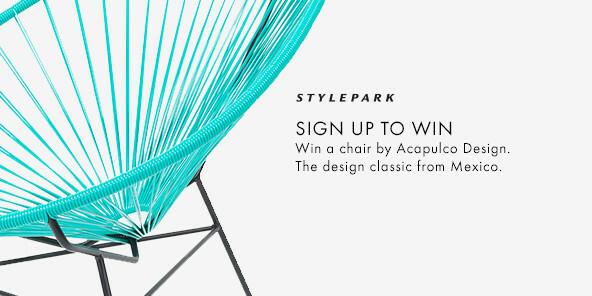 At least when it comes to design. Louis Vuitton, Prada, Dries van Noten, Alexander McQueen, all of these European fashion labels have their embroidery done in India, but none of them says so or uses this as a decisive sign of quality. The rich heritage of Indian art and crafts, which could easily be deployed in international marketing as a sign of distinction and great refinement, simply goes unmentioned. All that is to change if the “Be Open” think-tank gets its way. The international foundation established by Russian Yelena Baturina in 2012 during Milan’s Salone del Mobile seeks to use various events and exhibitions to highlight the globally present crafts and design skills, and the cultures they come from. The first stop chosen was India and international guests were invited to “Samskara – Made in…India”, which ran from February 10- 28 at the “Indira Gandhi National Centre for the Arts”. Sunil Sethi, President of the Fashion Design Council of India assembled the show in a mere eight months; it presents 23 designers and 350 products from 18 different regions of India. During that time, 1,500 people were busy making objects such as luminaires, clothes, accessories, furniture and even granite slabs. “The idea is to preserve craftsmanship and the related arts that would otherwise get lost, and secure them a place in the modern world,” commented the foundation’s director Gennady Terebkov at the exhibition opening. The contrast between the hustle and bustle outside and the tranquility inside the “Indira Gandhi National Centre for the Arts” could hardly be greater. Architect Anupama Kundoo, who had her Wall House from India’s Auroville reconstructed life size in the Arsenale for the Venice Architecture Biennial in 2012, handled the exhibition design. Granite slabs quarried in India and worked by hand form the floor of the windowless space, the edges of small pools, and rise up into bar-top like presentation surfaces. The idea is to create the feel of a concept store rather than a museum-like aura. 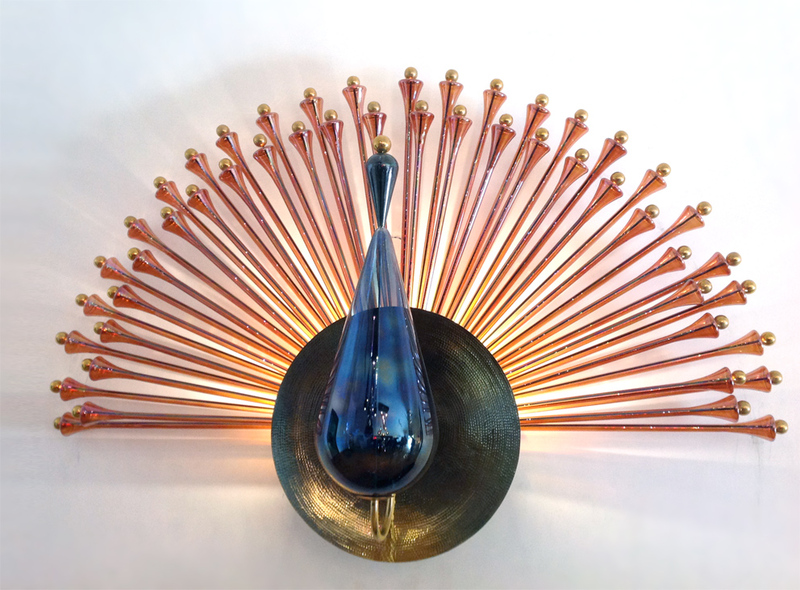 Indian design is staged under hundreds of simple metal lights – with the decidedly contemporary wish to cast the “Made in India” label not only in a more modern light, but to show how it is practically on a competitive international level. Jiten Thukral and Sumir Tagra got to know each other at the New Delhi College of Art and have collaborated since 2004 – and are among the best known Indian artists worldwide. The duo has created bags for Italian fashion house Etro and drew on the traditional Persian Paisley patterns in the process. 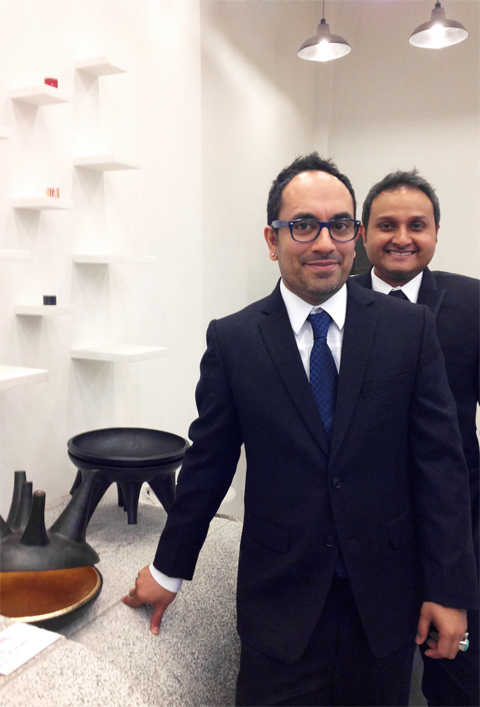 Two years ago, Art Basel invited Thukral and Tagra to showcase their porcelain one-offs. Starting with historical vases from the Meissen archives they created sculptures that drip nostalgia but are painted in their typical images. 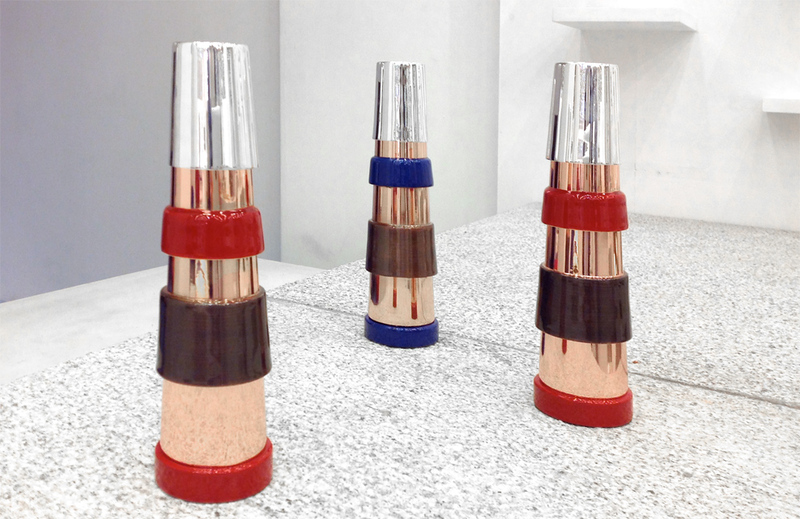 In the exhibition in New Delhi they are presenting clay pieces that are meant to function as loudspeakers and charging stations for Smartphones – clay is one of the most typical of Indian materials. As is silver: The owners of the Episode manufactory in Noida are now in their fourth generation, and the company is busy making beakers, bowls, plates, jugs and decorative objects. “My granddad repeatedly corresponded with Georg Jensen,” comments Deepak Whorra, one of the Episode owners. He’s proud of the long-standing knowledge transfer between India and Denmark. And he emphasizes that India has boasted a highly developed metal working tradition for millennia, explains the importance of silver for Ayurveda, as it is said to be very good to purge toxic substances. Drinking vessels are partly coated on the inside with copper, a chemical element said to have a favorable effect on the health if water is drunk that has been in surface contact with it. Prateek Jain and Gautam Seth, the two owners of Klove in New Delhi, also have an interesting approach. India has long had a sterling reputation in glass-making, examples being specialty glass for the chemicals industry or for medical applications. Why not make more of this they asked themselves. 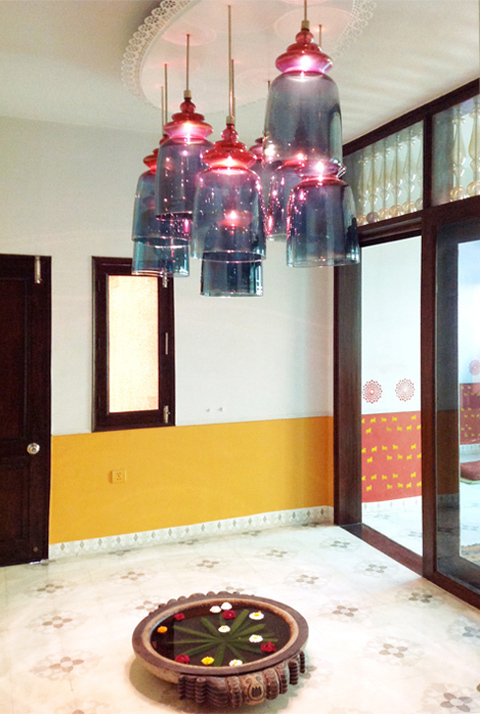 Ever since 2005, Jain and Seth have been establishing glass-blowing in India. Their candelabras are now to be found in many hotels, stores and private homes, and are inspired by Indian jewelry or motifs that are highly popular motifs there, such as flowers and birds, above all the peacock, India’s national animal. The exhibition in New Delhi can only mark the beginning of a debate on the quality of hand craftsmanship in design. Indeed, the Be Open foundation has taken as its motto this year “North/South – East/West” and plans further activities in other countries. At any rate, the Samskara exhibition clearly demonstrates that for all the cultural differences in taste Indian design can compete with Western products, or is even part of them, without us realizing the fact. Bauhaus in Calcutta: The title evokes images of gleaming white houses in some far-flung exotic land filled with elegant tubular steel furniture. The two goddesses of Indian design: In Ahmedabad, the descendant of an ancient textile empire is working hard to change the image of Indian design. 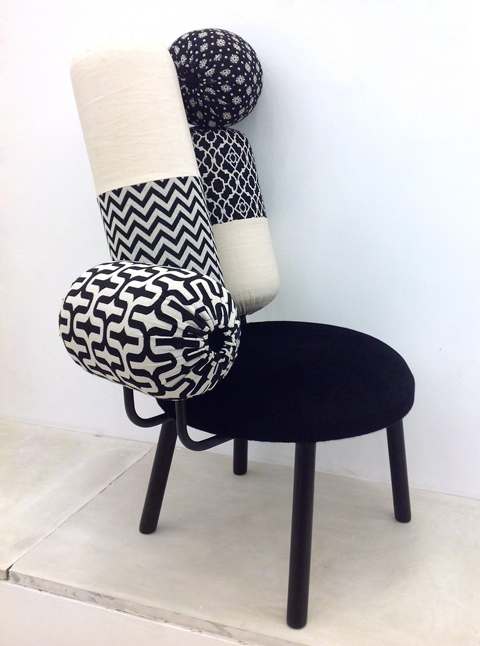 “Potli Chair“ by Gunjan Gupta. Water blossom play: Klove shows his lights at a house in New Delhi where you can find typical arrangement of bassins with flowers. 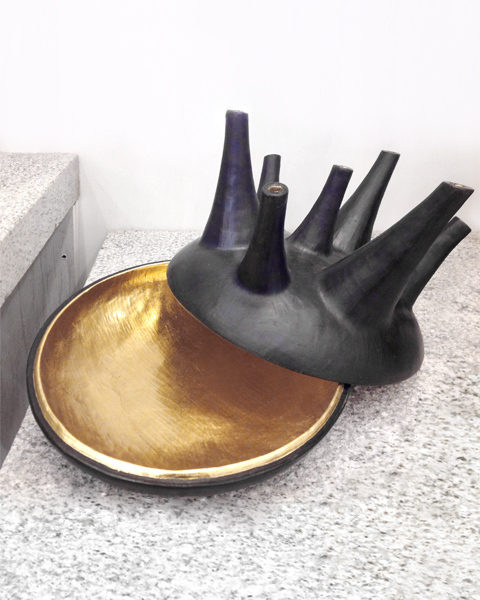 Sahil & Sarthak: new interpretation of „Longpi“ ceramics, typical for pots and bins in northern India, now with golden layers. 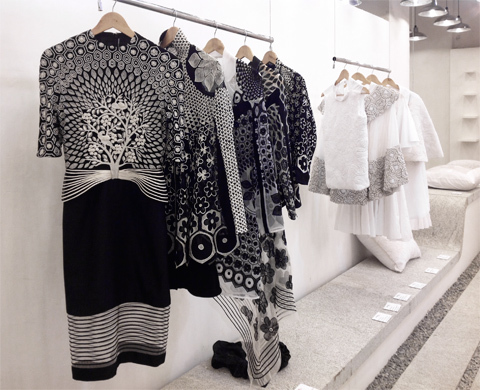 Master in Milan: Sahil Bagga and Sarthak Sengupta have founded their studio Sahil & Sarthak in 2009. Go for the detail: Fashion by Rahul Mishrader (left side) and Ashish Soni (right side). 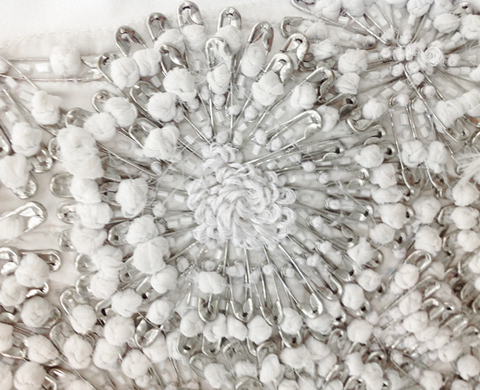 Fashion with surprise: Ashish Soni uses saftey pins for the ornaments. 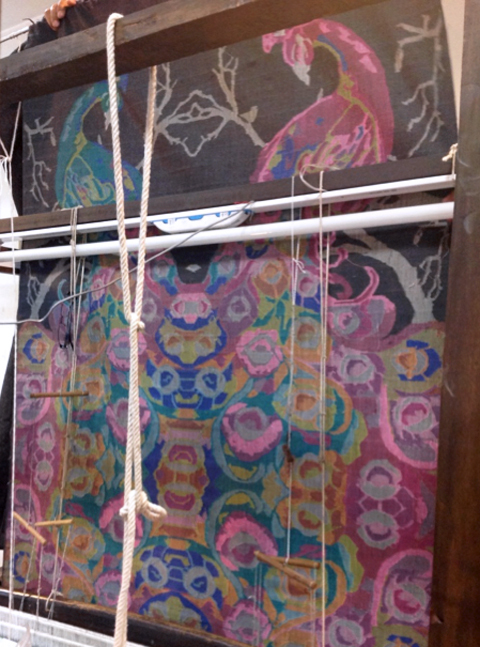 Like in former days: At Ezma they weave scarfs by using a 600 years old technique. 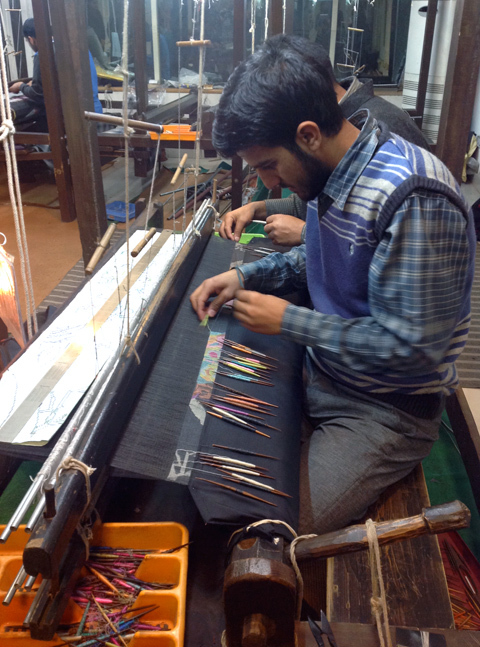 Cashmere art: it takes weeks to weave such a textile. Fantastic: Kloves homage at the peacock as the national animal of India.